At the first look, it may remind you of dark jails. As you go near, the large cave entrances and pillars come to your view. Lenyadri Caves are the mountainside caves that goes back to several centuries. Once upon a time, Lenyadri Caves in Pune served as Buddhist Viharas (residential complex of Buddhist monks). However, it is more famous for the Ganesha Temple. Yes, Lenyadri Ganesha is the one of the temples among the Ashtavinyak Temple Tour in Maharashtra. According to Ganesha Purana, Lenyadri is said to be the birth place of Lord Ganesha. One version of the legend says that Goddess Parvati meditated for 12 years to get a boon from Ganesha. Her wish was to get Ganesha as her son. Looking at her devotion, Ganesha agreed to be born as her son. It was after that Goddess Parvathi made a clay structure and chanted a mantra (hymn) to give life to the clay doll. Thus, Ganesha was born in Lenyadri and the hill became popular as Ganesha Hill. Interestingly, all the caves except Cave No.7 (Ganesha Cave) are Buddhist Caves. They belong to Hinayana Buddhism and mostly used as residential quarters of the monks. Each cave is numbered and they almost resemble each other in their design. However, not much is known about the establishment of Ganesha Temple here. However, Ganesha Cave is said to be the earliest among all the caves. Lenyadri Ganesha Temple has a pillared verandah, a large hall and a sanctum. The visitors have to climb several steps to reach this shrine. The statue of Lord Ganesha is called as Girijatmaja meaning 'a God of the Mountain'. The deity is said to be Swayambhu - self-manifested one. Lenyadri Ganesha Cave Temple is well-known because it is included as one of the temples in Ashtavinayak Temple Tour (journey around 8 Ganesha Temples). It is visited as the 6th shrine in Ashtavinayak Yatra. Most caves are similar in design with stone benches and prayer halls. Apart from two Chaityas (Buddhist prayer halls), all others are resident cells. Like in other caves of Maharashtra, Lenyadri Caves also have beautiful sculptures carved on the walls. Apart from the caves, the hill of Lenyadri is an attraction in itself. Especially, during the post-monsoons, the hill covered in green moss is a visual treat. 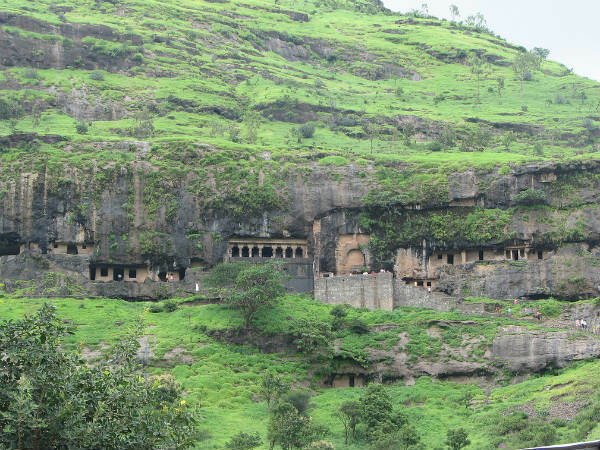 Lenyadri Caves is around 5km from Junnar in Pune District. Tourists can either take a bus from Pune or Mumbai to reach Junnar and from there travel to Lenyadri. Otherwise, it is better to book a private cab or private vehicle to reach Lenyadri Caves.